US and European media outlets reported anti-Chinese protests across Vietnam. Claims regarding numbers varied greatly from several hundred to others claiming several thousand. The Western media was particularly careful not to mention the names of any of the individuals or organisations leading the protests. People were angry at a draft law that would allow 99-year concessions in planned special economic zones, which some view as sweetheart deals for foreign and specifically Chinese firms. Though the Post and others across the Western mainstream media claimed the protests were “peaceful,” they eventually spiralled out of control resulting in assaults on police and vandalism of public buildings. The systematic omission of essential facts and intentional misrepresentation regarding the protests follows the same pattern observed regarding other US-European sponsored unrest around the globe. The Post itself would claim the protests took on a “nationalist” tone, yet in the Post’s own article and without an explanation from the Post as to why, American flags could be clearly spotted among the mobs. The few names that were mentioned by the US-European media included well-known so-called “pro-democracy” activists drawn from networks openly supported by Washington, London and Brussels. This included Duong Dai Trieu Lam, mentioned by the Financial Times in its article, “Anti-Chinese protesters take to Vietnam’s streets.” He’s a member of the so-called Vietnamese Bloggers Network which routinely coordinates its anti-government activities with the support of Western embassies. Quynh, a single mother of two, had given interviews to Voice of America and Radio Free Asia, her lawyer Vo An Don said. She founded a network of bloggers in her homeland and has written about deaths in police custody, environmental disasters and human rights. She received the Woman of Courage award at the U.S. State Department in March this year, presented by Melania Trump. Vietnam said the award “was not appropriate and of no benefit to the development of the relations between the two countries”, the Guardian reported. Other US-European sponsored opposition figures include Nguyen Van Dai who heads the so-called “Brotherhood for Democracy,” another transparently US-funded and directed front aimed at pressuring, destabilising, co-opting and/or overthrowing Vietnam’s political order. Nguyen Van Dai was recently released from prison and exiled from Vietnam. His exile was not the first. There was also blogger Nguyen Hoang Hai, also known as Dieu Cay, who when exiled to the United States, was greeted by supporters waving the yellow and red-striped flag of the now defunct Republic of Vietnam (South Vietnam), the proxy state created by French colonialists and American invaders during the Vietnam War. His return was covered by US State Department-funded and directed Radio Free Asia’s Vietnamese-language version. The National Endowment for Democracy (NED) is greatly troubled by the arrest in Vietnam of Le Quoc Quan. Le Quoc Quan, a lawyer, has recently been in residence at NED on a congressionally-funded Reagan-Fascell Democracy Fellowship, pursuing independent research on the role of civil society in emerging democracies. He was arrested on March 8 in his hometown in Nghe An province, only 4 days after his return from Washington to Vietnam. At this time, Le Quoc Quan’s whereabouts are unknown, and there are no public charges against him. As well as providing legal representation to those who are persecuted for claiming their rights, Le Quoc Quan runs a blog. 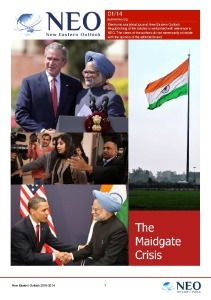 In this blog he writes about various issues including civil rights, political pluralism and religious freedom. He has also participated in a number of protests against China’s territorial claims in the South China Sea. It is clear that Vietnam’s so-called opposition is in no way “nationalist,” and merely opposes Chinese interests in Vietnam because Washington opposes them. By taking US and European funding and carrying out Western directives, they are actively undermining Vietnam’s sovereignty, not upholding it. It is also clear why the US and European media omit mention of opposition leaders even when covering significant events like the recent anti-China street protests. Had the truth been told to international audiences, the opposition’s hypocrisy would be exposed and their legitimacy undermined. At a time when the US and its European allies make accusations about supposed “Russian interference,” US and European-backed mobs take to the streets in nations like Vietnam, attempting to influence national policy and decision-making, while literally flying US flags. For Hanoi, it must continue its balancing act between Beijing and Washington. 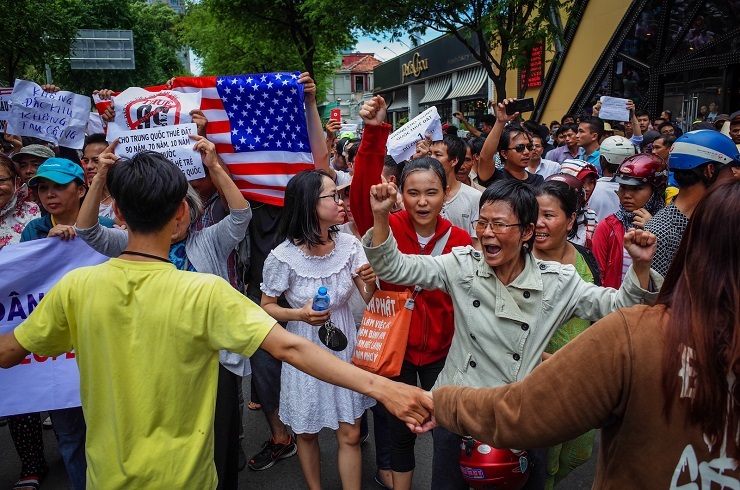 But the sort of opposition Washington is cultivating in the streets of Vietnam appears to not only be overtly coercive, but clearly connected to unfinished business dating back to the US invasion and occupation of Vietnam. Hanoi and Beijing have faced off militarily as well, but the threat the US posed and still poses is not a matter of disputed borders between two nations, but Washington’s enduring desire to control all within Vietnam’s borders. Vietnam is not the only nation facing growing US coercion in the form of US-funded and directed opposition movements. Cambodia and Thailand likewise face opposition parties entirely backed by the US and its European allies. US-backed opposition also just assumed power in Malaysia and a US-funded and directed opposition party has already seized power and ruled in Myanmar since 2016. US efforts to undermine and overwrite national sovereignty across Southeast Asia includes regional synergies between opposition fronts in each respective nation. 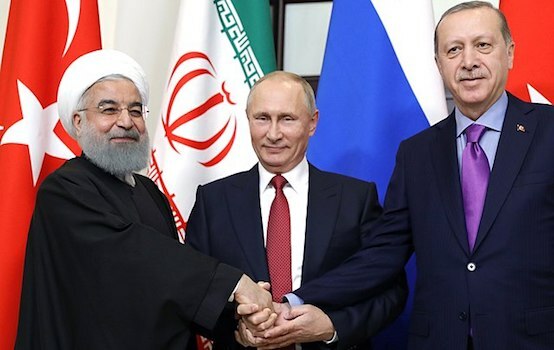 It would likely benefit targeted nations to likewise coordinate their activities in countering, diminishing or entirely uprooting foreign-funded and directed networks interfering in the region’s internal political affairs.